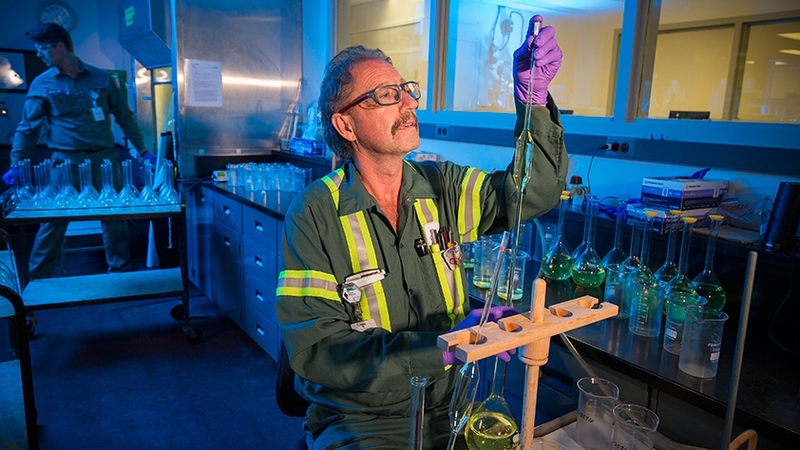 Cameco's environmental monitoring programs include tens of thousands of analyses on air, water, soil and vegetation samples taken throughout the year. In addition to safety systems and procedures, Cameco's fuel services operations have extensive pollution control and emission prevention systems in place to protect the environment and local communities. To continually verify the effectiveness of these systems, we closely monitor our emissions to the environment. Ensuring that we meet, and often exceed, all applicable provincial and federal requirements, our regular environmental monitoring programs include in-house or independent analysis of more than 29,200 samples each year. Regulatory oversight of these results is provided by federal and provincial authorities. Similar to our radiation protection program, for these parameters Cameco has established action levels, which are significantly below regulatory limits. Action levels serve as an early indicator of potential hazards that require investigation and corrective action but do not pose a risk to people or the environment. Air quality monitoring programs include continual emissions monitoring directly from plant stacks and ventilation systems as well as weekly analysis of ambient air monitoring in the surrounding area. In-plant air monitoring falls under our radiation protection programs noted under Safety. Analysis over the past five years indicate that emission levels at Cameco's fuel services facilities consistently remain far below regulatory limits. All liquid effluents are sampled and analyzed prior to discharge to ensure all federal and provincial regulatory discharge parameters are met. Depending on the specific facility's type of operation, these parameters can include regulated limits on ammonia and ammonium, fluoride, uranium, nitrates, radium 226 and pH levels. An extensive series of groundwater monitoring wells are in place at Cameco's Ontario facilities. Sampling schedules include monthly, quarterly, bi-annual and tri-annual analyses. Groundwater results are compared to screening criteria, including groundwater standards from the Ministry of the Environment and Climate Change “Soil, Ground Water and Sediment Standards for use Under Part XV.1 of the Environmental Protection Act”. Soil and vegetation samples are routinely collected from specific locations surrounding our Ontario facilities. The purpose of these surveys is to measure and document uranium concentrations in the soil and vegetation to verify that no significant build up has occurred. Soil samples are taken from varying depths. At our conversion facility in Port Hope, fluoride-sensitive vegetation is collected annually and assessed for damage. Beyond our in-plant radiation protection programs for our workers, at each facility we also monitor gamma radiation levels at the perimeters of our property lines. It's important to note that gamma radiation at low levels, usually referred to as background radiation, is naturally occurring everywhere, all the time. Our gamma monitoring programs ensure that local residents are not exceeding the public dose limit of 1 mSv/year established by regulators.